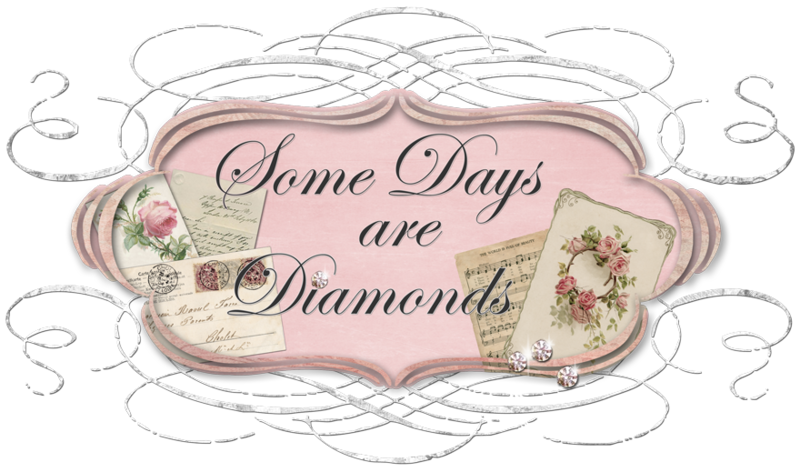 Some Days Are Diamonds: a couple of "good" things! Happy Monday! What a gorgeous day in So Cal!!! Thunderstorm during the night and it was AWESOME! It dawned on me this morning, that maybe other people have the same dilemma I do. I had sent an Email out a few months ago to all my friends, asking what everyone else did to solve this problem. Now I'm asking you. As you can see - I love cookbooks! I love to cook, and worse yet, I love to eat. But! My problem has been trying a recipe out of a cookbook, everyone loves it and I go to make it again and can't remember which book it was in. Duh! Here's my solution. About a year ago, I started writing the name of the dish, the book it is in and the page it is on, on a 4 x 6 recipe card and putting it in my recipe box. Now when I need to find it fast, I am able to. Just thought I'd share this thought. A lot of people have computers in their kitchen, but mine is all the way upstairs and not convenient to store my recipes on. What's your idea? Please share! A really good thing happened to me yesterday. A friend of mine called and asked if she could practice a painting technique in my kitchen. (Hmmmmm. What if she messes it up?) I said sure and she came over and proceeded to paint the five electrical outlets on my backsplash to match my granite. It took her about 1 1/2 hours by the time the paints dried and she could put a clear coat on. And let me tell you - it looks 100% better in person than it does in this picture. She did a great job! I love it! There are two in this shot. Didn't she do good? Good job Janece!!! Well here are a few more shots of my happy room. I'm so organized, I just love it! I still have lots to do with sewing the valance and the tables skirts, but I'll get it done. On the white wall I want to hang a huge bulletin board for inspiration and ideas. I have lots of empty space on my bookshelves to add new treasures to. I love the hunt!!! My computer isn't quite capturing the color correctly. It's an apple green. I'll end my day by sharing something kind of embarrassing. I learned a valuable lesson yesterday while installing the handles on the cabinet doors. "Never touch the drill bit when you just used it to drill a hole." It's HOT!!!!! My husband started laughing and then just says "Well, you'll never do that one again!" Your room rocks! the painting job rocks to! As for the cookbooks, I have the same dilema. I have books all over the place. I also have cards, some I have filed, some remain in a much used little binder. I have 0 ideas on how to manage this! What a happy color for your craft room. I love it! Your cabinets look great too! That's a great idea for your recipes. I wish I loved to cook...but guess that's cuz I really don't like to eat food! Give me dessert! What did you find in Temecula?? ?Anything good? Hello...I don't have any ideas about cook books...I hardly can find mine among all the clutter in my kitchen.LOL I love your happy room as you call it. I need one of those to create in. Love all your great photos. Stop by my blog and enter my free drawing. You could use the items in your happy room. Have fun today and every day. Your happy room is beautiful!! First of all I am going to use your cook book idea! I go crazy looking through tons of cook books to find the recipe I am looking for! I have been racking my brain as to how to organize them and this is a great way to do it with out having to write them all down in my own book! I agree with Connie - What a happy color for your craft room! I can't wait to see your sewing projects up! Looks MAR-V-LOUS!!!! Hi there! I'm over from Connie's blog. I love to cook also. I host a cooking show and my passion is celebrating family, food, fun and friends! Please stop by and say hello. This is really a nice room and the sky pictures is too good.